There are two questions that have been asked of me since I learned I am deaf/hard of hearing. "How well did you do in school?" and "How did you learn?" These are really great questions. Learning that I have a significant hearing loss has helped me understand the answers to them so much more. The simple answer, I did horribly in school. 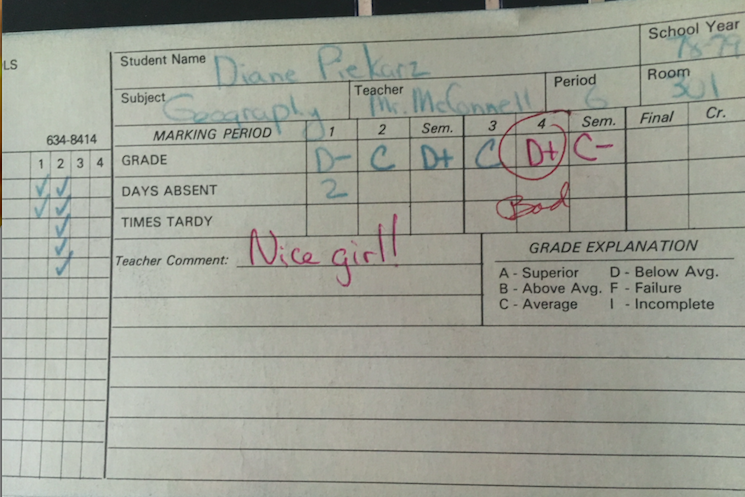 Teachers liked me a lot because I was a happy student. I was a student who wanted to learn. However, my grades reflect my struggle with learning all the way from kindergarten through to my freshman year in college. So then it begs the question, "How did you get through college?" To answer that I would need to start at the beginning. One of my first memories of learning actually happened right in my own home. My siblings and I all loved to play school. My sister was always the teacher and I was always the student. This little school house is where I learned all of my letters. I also learned to read in our little school. If I recall correctly, our toy box had a chalk board on it, and we would line up two of our little chairs from our little table and chairs set, and listen closely to her lessons in our little one room school house in our basement. Little did I know that this up close and personal, one on one instruction, would be the basis for all of my learning for the rest of my life. After I learned all of my letters, she taught me how to read. We read little books out loud to "the class". I even learned to write my name in cursive in this little school. When you are part of a big family, (I am the youngest of nine), stuff like this happens when the rest of the world is not even noticing. This formed my love for learning. I was excited to go to school. My first teacher, my sister, made me realize how much fun learning was going to be. I was ready for school. The very first day I went to school I brought all of my letters and reading to kindergarten with me. Unfortunately, when I finally went to a real school, it was nothing like my first learning experience. My teachers were very happy that I knew my letters and I could read. My report cards reflect that. Little did they know that my sister had already taught me one on one. Even though my report card stated that I had a "hard time communicating clearly"
my reading skills and letter skills showed I could learn. However, learning in a large group setting was very difficult for me. School was very difficult for me. Many attributed it to the fact that my dad died when I was two and a half. I only knew this, it was hard for me. Interestingly enough, I have all of my report cards. After I found out I am deaf/HOH I took a trip down memory lane. It is all right there. "Diane reads very well, however, she has a difficult time with listening comprehension." "Diane is a joy to have in class. She needs to work on her academics and to work independently." Right from the beginning in kindergarten there was a flag. The teacher wrote on my report card that I "did not express ideas clearly, however I had a strong interest in reading." Some years they had me re-do the standardized achievement tests one on one. The years I "excelled" were the times I had to retake the test one on one. When I say excel, it is a relative term. My scores are nothing to write home about. Even with the one on one, my listening comprehension portion fell into the low average, some years below average. So the signs were there. It always puzzled me why it was so difficult for me to learn when I loved to read and write so much. I would go home from school and directly pick up a book or write in my journal. I would read everything I could get my hands on. So if I loved learning why was it so hard? I know now why it was so hard. If you can't hear like the general population, and you are very significantly hearing impaired, learning will be hard. And many people missed it. When it came time to go to college I took my ACT and did only ok. Which was par for my course. I was grateful when one of the UW schools accepted me. It was the one I wanted to go to, so I was thrilled. My first semester was a total fail. I went to class, took notes, and came out with a 1.9 GPA. One thing was different that semester. That Christmas, during semester break, we promised each other that the next semester we would study every Thursday, Friday and Saturday, along with the studying we would do all week long. We made a pact with each other that we kept the remaining years of college. I liked this boy so much and I wanted to stay where he was, in college. So I figured out a system to learn. Every week, I would completely read the chapters from my book before the lecture instead of after the lecture. I prepared even if the professor never brought the information up again. If it was in the syllabus, I read it, highlighted it, took notes, and brought those notes with me to class. Then I would sit in the front row and I would mark what I heard him repeat from my pre note taking. At the end of the week, every Friday, I would make office hours with my professors to confirm that my notes were correct, and that I was understanding what they said in their lecture. I let them know that I had a hard time learning and they were very happy that I wanted to learn the material so much, so they worked with me. As the semesters passed by I ended up being a student that they called on in class because I was the student who understood the material. This experience was all new to me and I grew to love the art of learning. I became passionate about empowering others to teach themselves before they ever went their classes. I believed it was the best way to learn, and as a teacher I started the first 2 weeks of my school year each year teaching what I began to call my process, "Learning to Learn". I wanted all of my students to have this level of independence in their learning. As a parent I taught my children the same thing. I also wanted my children to have this level of independence in their learning. My first three children went to college knowing this was what the needed to do starting the very first day to be successful. I told them often that they should not be dependent on their professors or teachers. I told them that they needed to go to the information before the information came to them. My system worked for me, and I taught my children the same system. My children learned as deaf children learn. I now see the amazing value in that. They do too. As I look over all of my school records, there were so many times my hearing loss was almost caught. After I found out I was deaf/HOH a memory from college came flooding back. One of my professors who was teaching a lecture on Speech and Hearing allowed me meet with him weekly to confirm my notes, just as my other professors had. One Friday, he asked me where I "learned to speak." All of my life I thought I had a deep voice. My mom had a deep voice. It is not nearly as deep as I heard it my whole life. It is still deep. But now I know not as deep as I heard my whole life. Thinking he was asking me about my "deep voice" I said, "From my mom." He said, "Well, you are copying someone, your speech is not natural." As I look back now, he was not talking about my "deep voice" that I thought I had. He was talking about my speech. While I grew up, I watched every person speak. I watched their mouths, their teeth. Every part of their speech. I studied people speaking like it was a ballet. Or I was a musician. I knew I could do this. I knew I could get it right, and my dad would not be upset. And I did! I eventually stopped getting in trouble for not "enunciating, articulating or mumbling." I worked very hard at speech. It was what was the hardest for me. Once I heard my voice for the very first ever in my whole life, after I got hearing devices, I realized I never had a deep-horse voice. It is very soft and feminine. And beautiful. I had never known this. It hit me right in that moment he was referring to my actual speech patterns and not my voice. All those years ago, when I was told to articulate, enunciate, speak clearly, I worked hard to do that. I was copying the speech patterns of my siblings and parents on the sounds that I severely cannot hear. So how did I learn if I could not hear like the rest of the world? 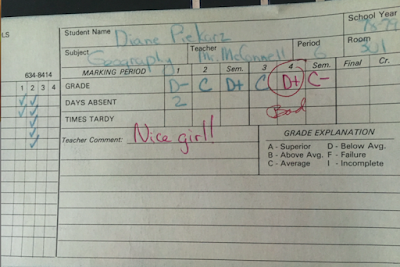 My report cards reflect that all the way through. A lot of notes about, "Diane needing to be a more independent, her comprehension is low, she needs extra help..."
with notes that said, "Nice girl." Until I got to college. I liked that boy so much that I wanted to stay with him for the rest of my life. So I figured out a way to learn so I could do that. I graduated with about 3.24 or a 3.42. Neither of us can remember which one. I learned how to learn. Inadvertently, I taught my children how to learn as a person who is deaf/HOH. That boy was John Grover. What a difference one person can make in your life. This entry was posted on Monday, July 11, 2016. You can follow any responses to this entry through the RSS 2.0. You can leave a response.